This was 7th Ave, between 46th and 47th Streets. 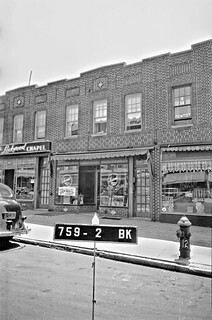 The bar on the corner was Hayes' Tavern (just reopened following prohibition repeal). The beauty parlor next door moved to 48th street, where I lived. The funeral parlor became a candy store, as I recall. No TV antennas! Notice the sign for Ruppert beer in the window of the bar, and the poster for the current movie at the Ritz Theatre on 8th avenue.